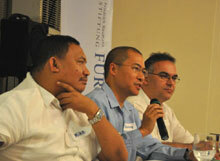 The Friedrich Naumann Foundation for Liberty International Academy for Leadership (IAF) alumni gathered at the Foundation’s office in Makati City on 18 February 2010 for its annual meeting. The IAF alumni group serves not only as a network but as an institution to further the development of liberal ideals and democratic processes. In keeping with this, the group invited Attorney Michael Dioneda, National Capital Region election director of the Commission on Elections (COMELEC), and Attorney Carlos Medina Jr., executive director of the Ateneo Human Rights Center, to an informal discussion on the May electoral process. Atty. Dioneda gave a short review of the automated electoral procedure. He touched on issues such as the voting process, security measures and back-up initiatives. However the integrity of Philippine elections cannot be left to the government alone. Atty. Medina spoke on the need for civil society to take an active role in safeguarding the democratic process. He explained the role of the Legal Network for Truthful Elections (LENTE), an election watch group he helped assemble. LENTE is composed of lawyers, law students and paralegals. It was formed in 2007 to monitor the canvassing of the then national elections. For this year’s elections, LENTE has expanded its efforts. Aside from monitoring the proceedings, it will work to ensure accountability during the elections process. It is training its members on elements of electoral offense, types of evidence needed, how to draft affidavits, file complaints, etc. LENTE is seeking accreditation with COMELC as a citizen’s arm so that it can work together with it not only in the filing of electoral fraud cases but also in educating the public on protecting its right to vote. It is true that there are many problems with the automated electoral process. However, COMELEC and civil society both want the same thing — successful elections. This is why LENTE is partnering with COMELEC to ensure that the democratic process truly reflects the public’s choices. The alumni event ended with the release of the 2010 alumni directory. This is a valuable resource in helping the group stay connected.